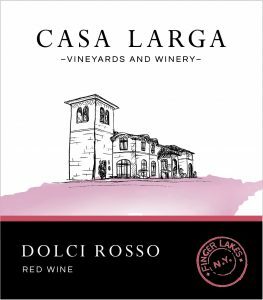 Dolci Rosso is a fresh, fruity, medium sweet red wine with vibrant Finger Lakes grape flavor, perfect to enjoy at cool room temperate or lightly chilled. Grapes. Cayuga, Colobel and Niagara. Viticulture notes. The grapes used in the production of this wine are cold-tolerant, making them ideal for the northern Finger Lakes region. We train their vines higher on the trellis than other varieties and they grow downward in an umbrella-like pattern. Winemaking notes. We ferment each of Dolci Rosso’s component wines separately in stainless steel tanks at low temperature, to bring out the fruit aromas and flavors in the finished wine. Serving temperature: At cool room temperature or lightly chilled (about 55º). Tasting notes. Dolci Rosso is a fresh, fruity, medium sweet red wine with vibrant grape flavor, fermented and aged entirely in stainless steel tanks. Pairing suggestions. Pizza, and meats with barbecue, ketchup and other sweet and sour or sweet and salty sauces.